Join us at The Station Theatre, Hayling Island on 26th January for THE MAGIC OF THE MUSICALS and shine a light on those winter blues with some show stopping numbers. This is quickly followed by the incredibly moving play by David Seidler, THE KING'S SPEECH, at The Square Tower from Tuesday 29 January - Sunday 3rd February. 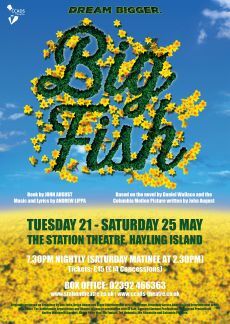 In May, we return to The Station Theatre with one of the first UK regional productions of the musical BIG FISH, based on the novel by Daniel Wallace and the Tim Burton film. Moving, engaging and compelling, this is another gem that we are thrilled to bring to light for the first time locally. Late September we return to The Kings Theatre with a brand new production of one of the all-time great musicals, MY FAIR LADY, bringing this classic show back to the venue for the first time in more than a decade in a lavish new rendering. Finally, December will see us back at The Square Tower with the local premiere of one of the most acclaimed new plays of recent times: HANGMEN is a drama/black comedy from the inspired pen of 'Three Billboards in Ebbing, Missouri' writer Martin McDonagh and which played at The Royal Court before transferring to the West End and New York. We appreciate and value your support of CCADS Theatre and look forward to seeing you at one of our productions!